YouTube is enormous! The network spans all corners of the earth, is generating healthy revenues, has more people listening to music on it than all other music services combined...and it’s growing exponentially! Given the scale and multitude of relationships that exist between rightsholders, data distributors, collection organizations, and creators it is obviously very complex. This unique mixture creates incredible opportunities and challenges for all. To take advantage of the full power of YouTube, one needs a strong foundational understanding of how the music business and YouTube work in addition to the small, yet important, details. That is why we wrote this guide - to empower one with the building blocks to stay informed. Music Publishers and Record Labels who are curious about how to include YouTube, in a broader effort to fully exploit the copyrights they control. Writers, composers, and artists interested in a more elaborate understanding of how their musical works generate exposure and revenue. YouTube Creators eager to gain a deeper understanding on how music can be included in their videos and channels. YouTube might play a role in their music business. Attorneys, managers, staff, and the like that work ancillary to the music business. Ultimately our goal is for the reader of this guide is to walk away feeling confident in their understanding of how the moving parts of YouTube and the music business work together. The YouTube Guide for the Music Business is the most exhaustive resource on the subject that exists. It is recommended that the reader takes time to fully consume all of the information offered in order to take full advantage of all that YouTube has to offer. One will also find links to tools and additional resources that can be utilized to further one’s education and get the most from the network. Finally, as questions and ideas arise, please do not hesitate to reach out to Exploration for clarification. We are here to help. YouTube was created in 2005 by Chad Hurley, Steven Chen, and Jawed Karim, as a way to easily view and share video via the internet. It experienced explosive growth and was then acquired by Google in 2006 for $1.6 billion. In 2007, Viacom and other content providers sued YouTube alleging that the company should be held liable for copyright infringement for hosting 1,000’s uploaded by users of infringing videos between 2005 and 2008. The lawsuit sought more than $1 billion in damages. They settled out of court. A resulting provision stated Google needed to provide a tool for rightsholders that was “efficient” and “effective” for them to manage their rights. In 2011, Google acquired the company RightsFlow. RightsFlow had amassed an enormous catalog and developed software to aid in the identification, reporting, and payment of royalties associated specifically with music publishing licenses. Google took advantage of RightsFlow’s efforts and rolled the technology and data into what would become Content ID Content Management System. On January 1, 2012, the Content Management System (CMS) was launched and made available to select music publishing rightsholders. The CMS had already been made available to record labels and film/tv companies. Using the tools, rightsholders started to add and edit asset metadata on copyrights they controlled. Initially, rightsholders often exercised the policy to block or takedown any content that contained their copyrights. However, as the opportunity to monetize and generate exposure through User Generated Content (UGC) became a viable option, the trend has changed to track and monetize. Several thousand music publishers, record labels, PROs, and administrators now contribute to the CMS worldwide. YouTube makes money by selling advertising that is displayed in association with uploaded videos and via subscriptions to viewers for ad free content, offline access, and exclusive content through YouTube RED. AdSense was originally created as the advertising network to serve Google.com. It has since become the world’s most sophisticated advertising sales platform, providing advertisers with incredible control over their messaging and analytics. YouTube’s connection with AdSense has presented a unique opportunity to advertisers by offering them access to advertise on YouTube videos. YouTube ultimately splits its income from advertising and subscriptions with rightsholders. To date they have paid rightsholders in excess of $3 billion. YouTube has since greatly increased the scope of their offerings. They’ve increased the capability and capacity of Content ID, added access to new tools, and built recording facilities. They continue to forge strategic partnerships and create new ways to monetize content across the globe. Before moving too deeply into how YouTube and rightsholders work together, it is important to have at least a basic understanding of the relevant parts of the music business. It all starts with copyright and for the purposes of this guide we will be referencing the copyright law of the United States. Composition – The song. A composition is comprised of the words, notes, melody, and arrangement of a particular musical work. Compositions are owned by a music publisher. A writer or composer writes a song and then an artist or band performs it (sometimes the composer and artist are the same person, hence singer-songwriter). Other people may interpret a song in their own way after the initial performance. This is referred to as a cover. The same composition may be used in multiple different sound recordings. A cover must be licensed from the publisher just as the original recording is done. Sound Recording – The recorded audio. A sound recording is the actual music that has been created as an interpretation of a composition. A sound recording is owned by a record label. It may include vocals, drums, strings, horns, electronic sounds, or any other types of audio arranged into a single master recording. Master recordings originally got their name from the days of records being produced. The recorded version would have been the master, thus making all copies the slaves. A sound recording may be embedded in multiple different videos, and will have only one composition embedded in it. Music Video – The audio-video. A music video is video that has been synced to audio, for the purpose of interpreting the music in a visual medium. A music video is most often owned by the same record label that owns the sound recording. It might be a high budget choreographed production or something as simple as a recording of a live performance. Note the usage of the word sync, as we will see this again later. In its simplest terms, this is a reference to when audio is synced to a visual component, such as in a music video, tv, film, game, or sports broadcast...but let’s not get ahead of ourselves. When discussing a music video here, we are not talking about any random video that might contain a particular musical work, only the official music videos. A music video will have a sound recording embedded in it and the sound recording will have a composition embedded in it. In summary, a composition is the written song and it is owned by a music publisher. A sound recording is the actual recorded audio, which has an embedded composition, and is owned by a record label. Finally, a music video is visual imagery synced with a sound recording and is usually owned by the record label as well. Each are unique and distinct copyrights. For YouTube, there are primarily two of these rights at work, which require that one obtain licenses. They are the right to prepare derivative works, which relates to a sync license, and the right to perform publicly, which relates to a performance license. A performance license is one that dictates how music publishers are paid when works that contain their compositions are performed publicly. This license type was originally created to insure that composers were compensated when their written songs were played during concerts and other live performances before records, cds, and the internet existed. Radio airplay in the United States and music playing publicly, say for instance on the speakers at the local restaurant or mall, are both examples of a public performance. Performing Rights Organizations or PROs, whom in the United States are ASCAP, BMI, & SESAC, collect royalties from public performance. Performance licenses are mandated by the government for ASCAP and BMI. Performance licenses are negotiated independently by SESAC. The revenue generated is usually referred to and categorized as a performance royalty. Performance licenses and YouTube are related to music publishing. In order for YouTube to allow users to upload videos containing music, they obtained from performance license from the PROs - ASCAP, SESAC and BMI. Performance licenses are needed any time a song is played publicly (ie - radio, live performance, broadcast, and online video). YouTube successfully negotiated a deal with the PROs for use of their repertoire in the form of a blanket deal. YouTube pays the PROs for use of their entire catalog, via a flat fee that is then distributed to all writer/publishers of songs the PRO controls. A sync license is one that dictates how music publishers and record labels are paid as a result of their music being featured with a visual component. This may include film, TV, games, broadcasts, commercials, and web video. Sync licenses are individually negotiated independently by and paid directly to music publishers, record labels, or their representatives. The revenue generated is usually referred to and categorized as a sync fee or sync royalty. Relative to YouTube, sync royalties are generated via advertising. They are the lion share of the monies to be collected on the network. The royalty amount is directly tied to the viewing analytics within the YouTube system. It’s important to note that not all views generate the same amount of money, but we’ll get into this in more detail later. Music synced with any visual media demands two sync licenses, one for the publishing and one for the sound recording. Permission from both the music publisher and record label are required in order to use someone else’s sound recording in their video. If a YouTube user uploads a cover, live performance or any other video where only the composition is used, then only a sync license from the publisher is required. YouTube does not facilitate or negotiate sync licenses on behalf of its users. Instead, publishers and sound recording owners have the option to make a claim on any video that is uploaded that contains their copyrighted works, if permission has not already been granted. A music video license is one that dictates how record labels are paid for the use of their official music videos. They work in a similar fashion to sound recording licenses. In all markets outside the United States, both of the music publishing royalties, performance and sync, are bundled together and paid via the local PRO and then on to the music publisher or sub-publisher. There is not currently an opportunity for foreign music publishers to work directly with YouTube, only through their respective local PRO. Record labels are able to collect directly from YouTube or via their distributor for worldwide exploitation. A composition is the written song and it is owned by a music publisher. It is embedded in a sound recording. Multiple different sound recordings can contain the same composition. It generates a performance and sync royalty on YouTube. In the United States the performance royalty is paid to the PRO of the writer/publisher and the sync royalty is paid direct to the music publisher or their representative. In all territories outside the United States both royalties are bundled together and paid via the local PRO and on to the sub-publisher. A sound recording is the actual recorded audio and is owned by a record label. A composition is embedded in a sound recording and a sound recording is embedded in a video. Multiple different videos can contain the same sound recording. The money it generates is combination of performance and sync royalties. Record labels are paid directly from YouTube. A music video is a visual representation of a sound recording. It has the sound recording embedded in it and typically owned by the same record label that owns the sound recording. The YouTube Content Management System (CMS) affords rightsholders an opportunity to manage the copyrights they control. It is comprised of Content ID, Video Manager, Channel Manager, AdSense, Analytics, and Content Delivery modules. The CMS is a complicated and powerful tool, so we are going to start with its most basic parts and then bring it all together. An asset on YouTube is a container of intellectual property containing all of that copyright’s respective metadata. There are many types of assets in the CMS. Relative to the music business there are two primary types, composition and sound recording. A composition is comprised of the written words, lyrics, and melody of a song. It is usually owned and managed, partially or in whole, by a music publisher. An indie composer, arranger, or artist may act as their own music publisher for the purposes of collecting their royalties. Required metadata for compositions includes a custom ID (assigned by the owner), title, writers, publishers, ownership splits, territory of control, and related ISRC or related asset ID. While not required within Content ID, is recommended to include the International Song Works Code (ISWC) associated with a particular composition. ISWC’s are issued by ASCAP in the United States. Compositions are connected to sound recordings via a related International Sound Recording Code (ISRC). This connection denotes a composition being embedded in a sound recording. In order for a composition to make money or generate analytics via the CMS it must be connected or embedded in a sound recording. Music publishers typically have territorial specific rights to collect royalties. They defer collection outside their jurisdiction to sub-publishers via local PROs. A sound recording is the actual recording of a song. It is owned by a record label. Indie artists and bands typically act as their own record label for the purposes of collecting their royalties. In the CMS a sound recording has a corresponding reference file, which is a unique digital fingerprint. It is used to programmatically identify video that might contain that sound recording. Required metadata for sound recordings includes Title, Artist, Record Label, Territory, and ISRC. An International Sound Recording Code (ISRC) is assigned to a sound recording when it is being prepared for distribution and is used to identify it on YouTube and beyond. Record labels typically hold exclusive worldwide rights to sound recordings allowing them to directly collect all royalties. International Song Works Codes (ISWC) used to identify compositions and International Song Recording Codes (ISRC) used to identify sound recordings are not exclusive to YouTube. They were created decades ago to identify compositions and sound recordings across all aspects of the music business. The primary matching algorithm of Content ID utilizes a digital fingerprinting system that identifies videos that may contain copyrighted work. All uploaded videos to YouTube are compared against its library of reference files. Upon a successful match, the system automatically makes an ownership claim and applies a use policy to the matched video. Potential claims are made available within Content ID to rightsholders when it has been determined that there is a high likelihood that the video contains copyrighted material, but isn’t 100% certain. These claims are presented in a queue that must be reviewed manually on a day to day basis. Manual claims are done manually by searching for videos that might contain copyrighted work. When matches are identified, the rights holder can claim ownership on the video, in addition to a applying a use policy. If a video owner who has had a claim made on their video believes it has been done so in error or illegitimately, they can dispute the claim. The rights holder is made aware of the dispute in the CMS console. They then have 30 days to either remove the claim or uphold it. Content ID makes available the ability to add, edit, and manipulate asset ownership and metadata. Asset metadata includes writers, artists, publishers, record labels, unique identifying codes, and reference files. Composition, sound recording, music video, film, TV, game, sports, broadcast, and other web video assets all contain unique asset specific metadata. Conflicts within YouTube come as a result of multiple CMS partners placing more than 100% ownership on a single asset in a territory. When in conflict, an asset will continue to generate revenue, however royalties will not be paid out until the conflict is resolved. When an asset goes into conflict, the owners are made aware via the CMS console. They are encouraged to connect with each other to achieve resolution. Upon claiming ownership of an asset with Content ID, YouTube allows four policy options. These are listed in order from least to most stringent. This is important. When multiple parties have different use policies applied to a particular asset, the most stringent policy will take precedence. Monetize: Opt to have ads placed before, during, after, and adjacent to the video in effort to make money from its viewing. Track: Opt to prevent ads from appearing in association with the video, however will retain the ability to preview viewing analytics. This policy will be effect when no policy is chosen by an owner. Takedown: This is an official copyright strike and constitutes a legal action to remove the video, as a result of it containing copyrighted work. A channel owner will have their channel banned after receiving takedown notices on 3 videos. Three strikes and you’re out! In order to monetize content on YouTube one must sign up for and connect to AdSense, Google’s advertising platform. Connection of YouTube and AdSense is achieved within the CMS. Royalties are paid monthly via direct deposit. Extremely granular analytics are also provided. Google splits royalty payments at source, meaning that publishing royalties are paid directly to publishers and their representatives, while sound recording royalties are paid directly to record labels. A Multi Channel Network or MCN, works with channel owners to build and grow their channels. They often provide tools to help creators easily produce content that can be marketed in unique ways. An MCN may have preferential relationships with select advertisers, allowing them to keep the small margin between what is collected and paid to the creator and YouTube. By design, MCN’s aggregate many channels and have the ability to cross promote each of their creators’ content. Aggregators are companies that manage, monitor, and audit assets and videos for particular right’s holders. rightsholders typically call upon aggregators once they have reached a point in their career that their media is be infringed upon and shared across YouTube. Aggregators help with data management, application of use policy, claiming, conflict resolution and analytics analysis. Performing Rights Organizations or PROs administer the performance rights associated with copyright law, particularly collection of royalties between music publishers/songwriters and parties who wish to use copyrighted works publicly. A composition is uniquely identified via an ISWC or International Song Works Code. PROs calculate performance royalties as a function of the views a video accumulates that is associated with a particular ISWC. In the United States, YouTube has blanket performance licenses with each of the PROs and pays out only the performance royalty associated with views on YouTube. This is separate from the sync royalty or fee. Currently, in every territory outside the United States, a music publisher does not have an opportunity to work directly with YouTube and must collect royalties via their local PRO. Furthermore, in territories outside the United States, both performance and sync royalties are bundled and paid together. Ex-US PROs are also responsible for paying royalties that are generated as a result of viewing from that particular country, regardless of where the rightsholder resides. Here’s an example: The viewing of the Jailhouse Rock video in France generates some money owed to the music publisher and record label. The music publisher will be paid by their sub-publisher in France via the French PRO, SACEM. The record label will be paid directly from YouTube. Music metadata is all of the detailed information that identifies a particular piece of intellectual property. For a list of the minimum data needed for proper YouTube functionality, please reference the sample Catalog Metadata Template. The most valuable thing a music publisher and record label can have is well organized catalog metadata. The more clean metadata the better, if one wants to get paid. With a clean and thorough catalog one can get the most from YouTube. It will also allow one to maximize efforts in all music industry aspects including physical sales, streaming services, touring, and radio airplay. An asset on YouTube is a container of intellectual property. There are two primary types of music assets, composition and sound recording, containing all of their respective metadata. Asset Labels - Labels help one organize assets into custom categories. Music publishers and record labels often use labels to divide their catalog by writer, sub-catalog, sub-publisher, etc. Asset labels are free form and as many as needed may be added to an asset. Catalog metadata can be found via the US Copyright Office, PROs, Harry Fox Agency, Music Reports, Sound Exchange, other streaming services and you guessed it...from within the YouTube CMS. Other rightsholders may have already added a large portion of music metadata. RightsFlow amassed the initial metadata database and created the technology that ultimately became the YouTube CMS. Then the NMPA (National Music Publishers Association) and Harry Fox Agency, in their settlement deal with YouTube, added to their databases to YouTube, in one of the first large data dumps. Many parties have since added their own metadata to the YouTube data set. 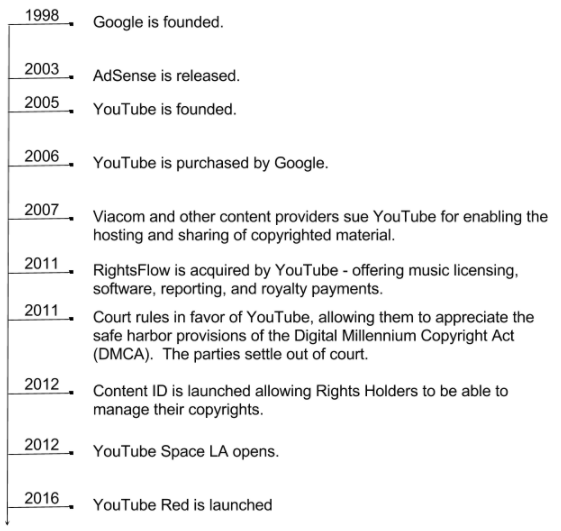 YouTube now has the most robust and largest collection of music rights information that exist. With all of this in mind, the data contained and accessible within the CMS is not perfect and contains errors. The good news that rightsholders have the powerful ability to edit and confirm the data pertaining to the copyrights they control. Metadata can be edited and delivered to YouTube a few ways. An individual asset's metadata can be edited via the CMS. Asset metadata may be edited and delivered in bulk to YouTube via the browser uploader located within the CMS, via the YouTube ingest spreadsheet or via Dropbox. Select CMS partners are granted API (application programing Interface) access to build proprietary software that interacts with the YouTube system, to manage large amounts of metadata. Vevo is a multichannel music video network that started in 2009. It is a joint venture between Universal, Sony, Google and Abu Dhabi Media. VEVO serves official music videos exclusively, to attract premium advertising. Some live performance and exclusive content featured, but rarely. There is no User Generated Content (UGC) on VEVO. VEVO uses all of the same technology as YouTube, including the ad sales platform, but is a separate company. The general public cannot sign up for channels like they do on YouTube. To get a VEVO channel one must be considered a record label or work with one. Some aggregators and third party services can help one get a VEVO channel. VEVO videos and channels are controlled via VEVO. However, they display the same and are mirrored on YouTube. All royalties for music videos and sound recordings are paid to record labels for viewership on VEVO. Music publishers who own the underlying compositions are now paid directly by YouTube. YouTube Creator Academy - Learn how to use YouTube. It is recommended that anyone working in music today, whether you’re a music publisher, record label, artist, composer, or manager take the time and go through the Creator Academy. It’s a free online resource. It’s specific to YouTube but the lessons learned can be used throughout one’s music business. It provides some extremely granular analytics specific to artists and bands. One can understand fan what/when/where of music consumption. This is great for planning a tour. YouTube Analytics are accessed within the CMS or should be provided in raw form from YouTube through your monthly reports. Viewer metrics and revenue is reported monthly. The data and tools may also be utilized to mould and sculpt one’s music business. It can be used to nurture one’s fan base, plan a tour, or sell specific merchandise. YouTube has built world class recording studios in several major metros across the globe. They contain full sets, professional equipment, and have enjoy the attendance of many creators that are keen to collaborate. One’s channel must reach a subscriber threshold in order to be invited to take the Unlock the Space course and subsequently access the facilities for free. They also host tours quite frequently to the general public. A lot of times, a record label will own a specific sound recording that gets released on the album or made available for download and streaming. They may not, necessarily own recorded versions of live performances. If an artist goes on tour and gets filmed and uploaded either by fans or their own crew, the band or artist may hold rights to that specific recording and can make a claim on it. In any case, a music publisher may make a claim on the video via the embedded composition, unless the uploader has obtained the proper sync license to record and distribute the live performance. If somebody covers a song, the composition or the publisher will be able to make up a claim on that cover. When a user creates a video and uploads it, they may check a box that says they own all of the the rights to that video 100%. Should an owner surface at some other time that has a claim to it, then they’re obligated to relinquish rights to that particular video. If I did a cover of Jailhouse Rock myself, Content ID wouldn’t pick identify me as Elvis because obviously I don’t sound like Elvis. However, the writers of that song, Jerry Leiber and Mike Stoller, still have the rights to the underlying composition. So if Leiber and Stoller were to find that video, they’d still be able to make a claim on that composition. If I had my own label, I could own a new master recording, but the publisher, Leiber and Stoller, would still be able to claim ownership of that composition. Other persons that might be owning something on YouTube are the broadcasters like ABC, NBC, CBS, The News, Saturday Night Live, ESPN or any sort of broadcast network. It’s the broadcaster or production company that’s going to own their particular media and they’ll be able to claim ownership to that and receive any money that it generates from YouTube. Many times people may put together their own “cut” or “clips” of a tv show or film, either for tribute or just to break it down for others. If they use music for this “remix” of a TV show or a film, then the Sound Recording or the Composition owner may have the right to make a claim on the video along with the clip owners. Play footage of videos games is very popular on YouTube. And it’s important to note that while music may be licensed by the video game maker, that license rarely includes the right for game players to upload footage to YouTube. Therefore the sound recording or composition owner could also make a claim to some user videos which contain video game footage. Any event uploaded by any YouTube user which may have music playing in the background is still a sync use, even if the music is incidental. In a lot of these cases, the composition or sound recording owner may still make a claim on these types of videos. Google's motion for summary judgement was granted on the grounds that the Digital Millennium Copyright Act's "safe harbor" provisions shielded Google from Viacom’s copyright infringement claims, but was later overturned in part, and the case remains pending. Copyright holders must consider fair use in good faith before issuing takedown notices for content posted on the internet. FAQ1: My song was played at a halftime during an NBA game and that broadcast ended up on YouTube. Do I get paid for it? NBA or any sort of sports property is going to license completely that work from the label or music publisher and therefore have the ability to do whatever they want to do with it. It’s all written by the contract between the broadcaster and the music owner, label or publisher. The broadcaster needs to get permission in order to do that and there’s going to be a contract in place when that appears. The stipulations of that contract determine whether or not the publisher or label will be able to make a claim to that video. FAQ2: Does YouTube compensate the copyright of the sound recording equally with the copyright of the composition? No there is a difference in the rate that is paid for a sound recording and a composition. The specifics of which cannot be disclosed publicly because of an NDA (Non Disclosure Agreement) we have with Google but we would be happy to answer you in a private consultation. FAQ3: In what territories are licensees able to process a sync license via a PRO without approval of the master owner and/or the composition owner? YouTube has agreements with the PRO in other territories to use the compositions for YouTube users based on views and you as a YouTube partner can specify if you want to block uses of a composition. You can change these policies on your assets if you don’t want people to be able to use your composition or your sound recording. Some sound recording owners will use block if they feel like something might get leaked in advance. They will get that sound recording up into the YouTube content management system early and they’ll set it to block until a few weeks after release in order to draw traffic to a specific channel and they’ll release it to where people can use the sound recording and they’ll monetize other uses after that. Sound recording agreements of record labels with YouTube states that people can use sound recordings but owners can block, monetize, track or take it down as they see fit. FAQ4: How big a record label do you have to be to get access? There are a few criteria. One is that one has completed at least audience growth and advance digital rights certifications within YouTube. It’s sort of the chicken or the egg kind of situation because you have to have access to the CMS in order to get invited to do that and that comes via company that is YouTube certified. Another criteria is that your music and your media are being shared and spread across YouTube in the web in a way that would necessitate your need. My assumption would be that given the power to go and then claim anything on the network with Content ID that (1) you need to know what you’re doing when you go in there because if you put an ownership claim on somebody else’s assets that you don’t own, you’re effectively putting your hand to the pocket and then (2), there’s a need for that. I mean if you got one or two tracks and they’re not getting shared, copied and re-uploaded and people are infringing on your copyright, you don’t need it and so you probably would suffice by just using YouTube as an end-user. FAQ5: How can I monetize my artist’s YouTube channels of unofficial video, i.e. clips with music and some without, if my artist belong to two different record labels? Basically, we’re talking about an artist’s channel where that artist has some degree of distribution either through a direct label or a distribution agreement. The sound recordings are going to be controlled on YouTube likely to figure that distribution agreement or record label agreement. For instance, my artist is signed to Warner Brothers Records so all his music videos are up on his official channel. But I’ve got a lot of interview footage and behind the scenes footage with him running on the beach with a dog and all kind of footage like that that I don’t want to put on my own personalized fan channel so to speak. When you monetize those things, you monetize them as a frontend user. You would sign up for a channel for your artist and then you would decide these are the kind of videos you’re going to put up and you’re going to monetize those videos on this channel and those videos on that channel. You do need to be aware and you do need to communicate with your record label and your distributor if you intend to use any of the artist’s sound recordings in those videos either as background music or some kind of alternative version of a music video or a lyric video because at that point, the sound recording that’s being controlled by the record label could make a claim on your video and change the monetization from directly to your artists to the record label because of the use of a sound recording. FAQ6: In order to ingest into YouTube CMS, do people need to use a third party company like Exploration? No, you can go direct and form your own relationship. Again, it goes back to sort of what thresholds and what sort of criteria they use for choosing folks. But in order to upload into the CMS, one would need to go through a distributor or someone that had a direct relationship with YouTube. FAQ7: Do video creators need a sync license? When you upload a video to YouTube, there is a box you check. It’s the Terms and Conditions that says that when you upload a material to YouTube, you promise YouTube that you own all of the material in that video and that you have all the copyrights. If you do not, and when and if the right’s holders do come forward, they can make a claim on that video which stands in place of the usual sync license. FAQ8: Huh? What am I supposed to tell our artist when they ask us how their rates are calculated? That’s a question for Google. Extensively it’s because they’ve done different deals with different folks, but the explanation that I give when someone says how much is a play worth, I tell them that it’s a moving target based upon advertising and subscribers. The amount of money that gets paid via advertising fluctuates based upon region, the demand, the number of subscribers and the market share. It changes literally by the second based upon how much demand there is for a particular asset. Whenever you hear someone talk about CPM (Clicks per Thousand) and then PPC (Pay per Click), those are the two modalities that Google uses to sell advertising. But those rates fluctuate and it’s an auction process on the advertising purchasing side that fluctuates with demand. FAQ9: How are music libraries handled? Music libraries and sound recordings are pretty simply ingested as reference files into the system. Everything that is ingested into YouTube gets compared against those reference files. The one caveat I would say is there’s quite a few royalty free production libraries and in those instances, one would want to disable Content ID. So if I’ve got royalty free music and lots of people have been using it for their music videos or their indie films or whatever, I would want my video to automatically claim ownership of their video on a royalty free asset. FAQ10: Can you explain ownership and territories? Did you say that there is only one owner of a channel or meta in North America/UK? On the sound recording side, there can only be one owner per territory. On the publishing side, there can be multiple owners. We’re talking about the backend and not the channel. Let’s say Aaron & I have got a sound recording we own, each in different territories.. I’m going to own it in the territories that I represent. Aaron is going to own his in the territories that he represents. For a sound recording that we own together, we might come together and say I’m going to take the US and you take Europe and then we’ll throw darts to the map for the rest of the territories. FAQ11: What is the percentage pay for the performance license? This is coming through ASCAP, BMI, GMR, and SESAC. I do know that ASCAP, BMI and SESAC have a blanket deal for their entire repertoire and they are paid a fee from Google. The system at ASCAP, BMI and SESAC for performance is that they have their top earners get the first bucket of money and then they have matching algorithm to match to a select group of additional videos or additional songs and then the third bucket of money comes via somewhat a random cherry picking from the catalog and I believe that the thresholds for payment are quite high there for performance on YouTube. FAQ12: What would be the best approach in order to help an older artist who is not adept with YouTube but has a user-generated content that gained hundred of thousands of views? How do they know if they have any money generated from those videos? There isn’t really any way of telling how much they’ve generated specifically, but I don’t believe that it makes sense to try and recoup that money. I think that the best idea is to install or put in place whatever your position if it’s to track, to monetize, to block and then move forward from that and to keep that policy moving forward. FAQ13: Is PRO Work ID a necessary data point to include in the composition asset? Any piece of metadata that you can aquire should be tracked. Just add another column to the template and keep track of it because every single data point adds value to your catalog in the long run. In terms of necessity, The ISWC is absolutely critical not only for performance in the United States, but also attribution for foreign because it’s paid out via foreign PROs. The reciprocity that takes place between domestic, United States PROs and foreign PROs are using the ISWC which is issued by ASCAP for that attribution. In Google, there are some custom fields in there where you can add some additional metadata, but Work ID isn’t required, but I would certainly include it. FAQ14: If a home-grown artist sings a song I wrote and uploads it to YouTube, how do I find it since the sound recording isn’t registered by label? That comes via manual claiming. There are two ways to claim a song within YouTube. One is the automatic matching and that comes via the fingerprint. It creates a digital fingerprint that is unique only to an artist. When another artist sings your song, it wouldn’t be picked up because the artist singing doesn’t sound like the original. So what do you do? It didn’t pick it up via the automated system. You can use what’s called manual claiming which is actually another level of authorization within YouTube CMS. When and if you do have access to the manual claiming, if you find videos that weren’t picked up by the automatic matching service, there’s the ability to manually claim that and attribute it to a particular sound recording and/or composition. FAQ 15: What happens if there’s an owner conflict about an asset, but one purported owner doesn’t respond to contact attempts? We all respect that sometimes we get busy and it can be a problem. I would say if you’re using the Content ID system or you’re using the CMS system to contact them, going outside of that system would be the first thing I would do and see who in that company do you know. Pick up the phone of that company and make a phone call and say, “Hey, I’m trying to work out this conflict so both of us can get paid and both of us can get this worked out.” Keep reaching out, use other avenues other than just to say we have a conflict. That usually helps to solve the issue. FAQ16: Would subscriber benchmark be eligible for YouTube-Google Studio or maybe the YouTube Space? The last time I checked in the United States or in Los Angeles, the YouTube Space threshold was 10,000 subscribers. In New York, I believe, the last time I checked, was 5000. I believe it may have even been 2500 in London and 2500 in San Pablo. FAQ17: Does YouTube pay name and likeness rights in addition to master publishing and video rights? FAQ18: Our publishing company carried direct agreement with YouTube in December of 2015. Our affiliated record label secured their direct agreement 3 years prior thousands of back revenue for sound recordings through the distributor. How soon are we going to receive the back money from the publishing side via their adjusted reports? It does take two to three cycles before you start to see the adjusted reports come through. Make sure that you have found any pre-existing assets because unless you find those assets that have already been generating money, they’re not going to know that that’s yours so make sure you find it. In terms of cycle, YouTube pays monthly. If one were to start and upload all of their metadata on January 1st, one would accrue money through the month of January and then about the third week of February, YouTube reports and pays that royalty. Moving forward, it’s every single month in that capacity. About February 23rd or 25th, one would get the analytics and the royalty payment from Google for the month of January. Please note that because of recent agreements between the NMPA (on behalf of music publishers) and YouTube, back monies from 2016 and backward have already been frozen and distributed. Therefore the only back monies available prior to 2016 are when assets have been in conflict between co-owners. FAQ19: How do you claim a sound recording on YouTube if the distributor keeps uploading the entire catalog even though I’ve opted it out of YouTube? If you got a distributor and you’ve opted out, it’s communication with them. You’re going to have to get with them and tell them stop uploading this catalog. Certainly, if they continue to keep uploading your sound recording or continue to keep making claims on your composition, get in touch with them directly. That’s the only way to ultimately solve it. Anything you do up until that, it’s just going to keep being a Band-Aid on the issue. FAQ20: ISWC numbers aren’t always assigned to registered songs. What should we do if there aren’t any assigned? I would assign them. I would go to the database over at ASCAP and assign it. I don’t believe it cost anything. ASCAP is the designated PRO in the United States that assign ISWC. You can get those for free and then by getting a bank of those ISWC codes, you know that they wouldn’t be assigned to someone else. If they assign you a particular sequential order of ISWC, you can be rest assured that those aren’t going to be given to somebody else. Therefore, they’ll be unique to your catalog and then you can use that to disseminate to all the different places that you might need it.